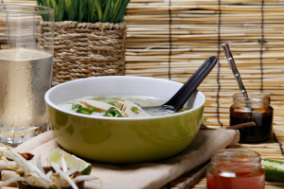 Pho Kit(tm) was created to make AUTHENTIC pho easier and more economical to make at home. Tracking down and buying all of the exotic traditional spices and pho rice noodles can be difficult, and expensive. Easy to follow directions, pho noodles, and the spice sachet complete the kit, and make making Pho in your kitchen easy and fun! The key to authentic pho is WHOLE spices instead of ground, which keeps your broth nice and clear. If only this photo were scratch and sniff! You'd smell the cinnamon, cardamon, star anise, fennel, coriander, and cloves..... delicious! A little rock sugar and sea salt is also included in the sachet, too, which rounds out the flavorful broth!